Lawn fertiliser is simply a food source that lawn requires on a regular basis so it retains good health, colour and help prevents against stress and diseases. It's an essential part of lawn care. But what are the best times to fertilise your lawn? And what's the best lawn fertiliser to use? Spring is an important time to fertilise, as your lawn breaks the winter dormancy. 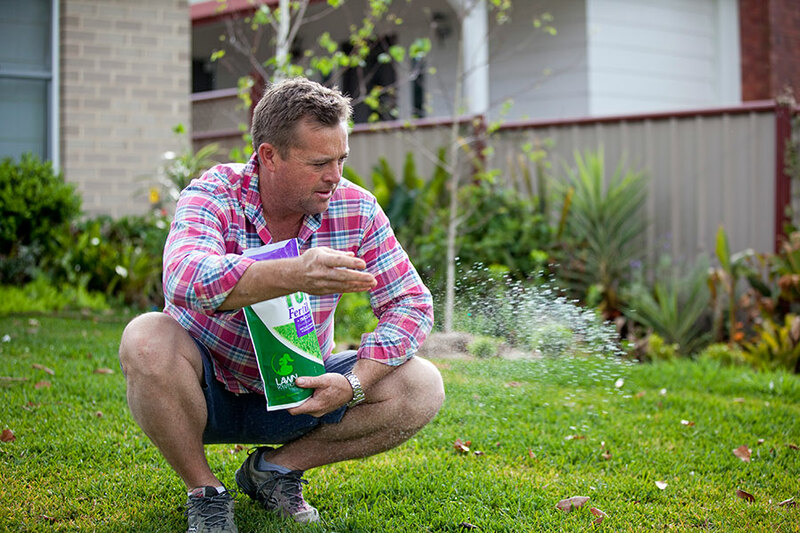 Your fertiliser application will assist the lawn to jump into growth as the weather warms up. Summer fertilising helps your lawn maintain an even growth pattern. Most fertilisers have added minor nutrients, which work to give your lawn the correct balance of nutritional requirements to make you the envy of the street. Autumn fertilising prepares your lawn for the winter months. It encourages prolonged growth to ensure a thick coverage and extended colour. This application is the most important one of the year. Everybody has different soil types and lawn fertilisers will work differently! In sandy soil fertilisers will leach very quickly, hence more applications to do the job. In a heavy clay soil your lawn fertiliser will last longer because of moister retention and slower water movement. Just to point out - all lawn fertilisers work differently, some require heaps of water when applied and give surge growth to your lawn, others are controlled release and require minimal water and work evenly over a longer period. What's the best lawn fertiliser to use? We like to apply a product that will spread easily and evenly, has low to no odour, requires minimal water, doesn't make my lawn grow crazy overnight and gives even growth for an extended period of time. So applied at 25-40grms per square metre in Spring, Summer and Autumn the LSA Professional Fertiliser will keep your lawn in tiptop shape all year round. If you want to have the best lawn try the proven fertiliser that is the popular choice for lawn lovers!